ROSS is an advanced legal research tool that leverages the power of artificial intelligence to make legal research more efficient. ROSS covers three areas of law: Bankruptcy, Intellectual Property, and Labor & Employment, providing you with on-demand answers to your legal questions. Best of all, ROSS uses natural language processing so you can enter your search queries using familiar language, not specialized search terms, connectors, or commands. 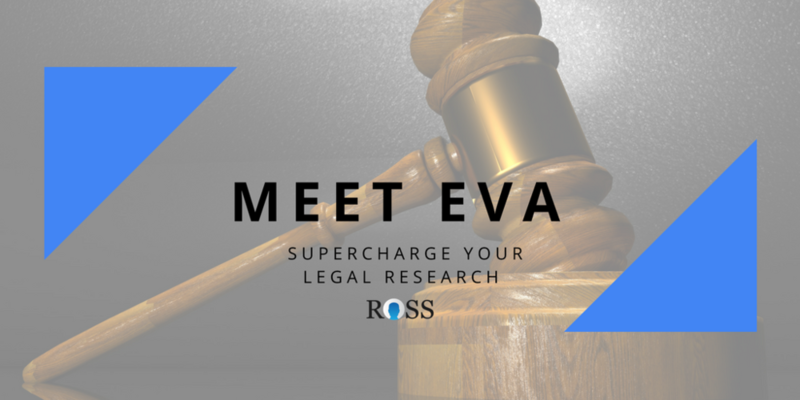 In recent weeks, ROSS Intelligence has launched its second standalone AI application called EVA, a free tool that allows users to upload legal briefs for analysis and review. After uploading a brief, EVA will check if cited cases are still good law and find cases that use similar language. EVA will also hyperlink all cases within the brief so they can be easily accessed and viewed in the ROSS database. Users can request a General Overview of any selected case at the click of a button, revealing the positive and negative treatment of the case and extracting key points of law within the case that closely answer any substantive question you ask. Artificial intelligence is gaining popularity in all fields, and the law is no exception. As users become familiar with AI as a legal research tool, the possibilities for "robot lawyering" will expand. Robots are unlikely to replace lawyers any time soon, if ever, despite media reports that sometimes sensationalize the impact of AI technologies. However, there is no doubt that technology will continue to shape the practice of law. EVA is just the latest development in AI technology to impact the legal profession in a very real and accessible way. Eliminating the cost barrier to accessing such sophisticated technology is a true benefit for EVA users.